the parrot of memory, originally uploaded by AmyEmilia. This little parrot lives on my kitchen window sill. Every time I see him, he reminds me of my grandmother. 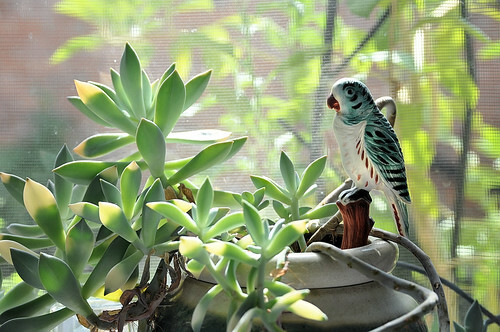 She had him in a plant as well, although I can't remember if it was in a kitchen window or one of the cactus plants. I love the way the afternoon light makes him glow with memory. 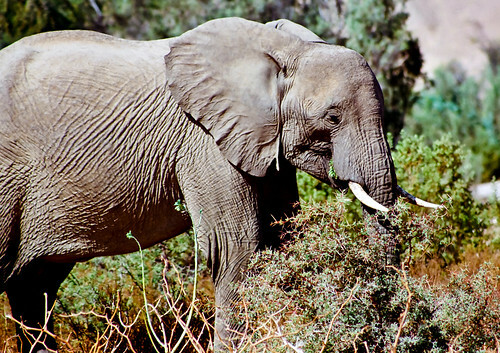 desert elephant - namibia 2002, originally uploaded by AmyEmilia. On an all-day game drive in the Skeleton Coast Park, Namibia... we saw quite a few elephants in a sandy river bottom. There was a family group of about 6-7 individuals, but most of them kept farther away. We were so close, could hear the elephant crunching the grass. Spent at least 15 minutes (although it felt MUCH longer) parked about 50 feet away from him. Eventually he became a bit agitated and did a little mock-charge but our guide assured us that we were fine... and of course we were. Seeing the famous desert elephants of the Namib desert was one of my life's ambitions. The game drive had lots of other moments (giraffe, eagle, gemsbok, jackals, impala) but this was easily the most remarkable. himba goat, originally uploaded by AmyEmilia. 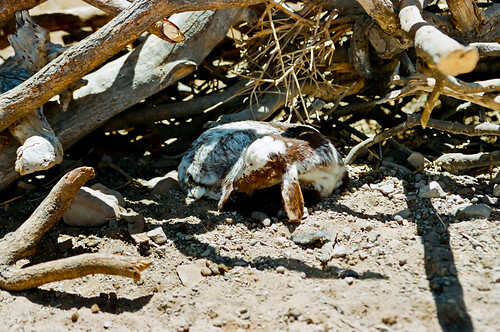 This little kid was curled up under a pile of firewood gathered at a Himba village near the Skeleton Coast. The sun was so hot, and the landscape so desolate. Hard to believe that the Himba make their living herding cattle! Taken during my visit to Namibia in September 2002. Renaissance time in Italy, for women who want it! Cook, eat, speak (and pray to stay)!! A fellow blogger is offering what sounds like an awesome opportunity to spend 10 days hanging out with fellow women, learning the language, and reconnecting with yourself. The price is right too, so check it out! Black Witch Moth, originally uploaded by AmyEmilia. As we were rinsing the sand from our evening beach walk, this moth flew over from the neighbor's house. We have seen them before but they are not common here. 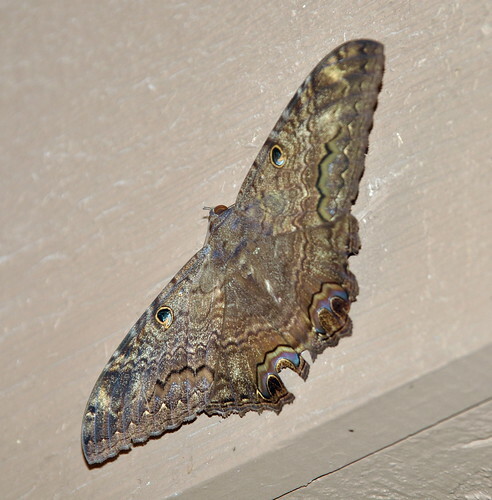 The Black Witch Moth (Ascalapha odorata) is, according to Texas Entomology, perhaps the largest insect north of Mexico. This particular speciment is a male, because it does not have a white band running across the wings. The Black Witch has a somewhat grim set of cultural traditions around it. Apparently it is a harbinger of death in most of Central America. If it enters the house, and there is a sick person in the house, the person will die. Fortunately for us, this guy only made it to the patio. 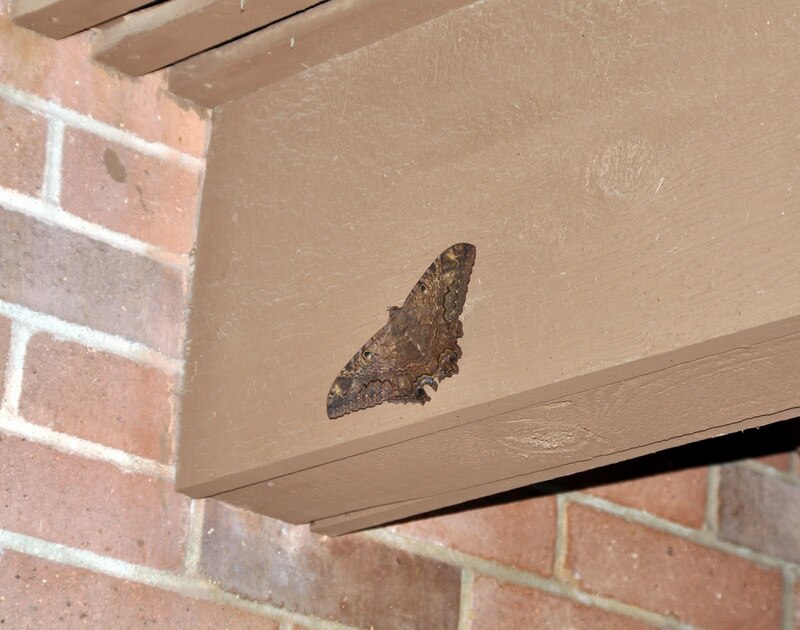 A brighter prospect is the South Texas tradition that says if the moth stays above your door, you will win the lottery! So I guess we should go buy a ticket. Here is a second picture, so you can get some idea of his size. I'd guess this guy is about 6 inches across.